Example of sign up sheet using the upgraded feature permitting participants to select the number attending. TimeToSignUp makes it easy to create online sign up sheets and registration forms. Create an account, then make your sign up sheet. 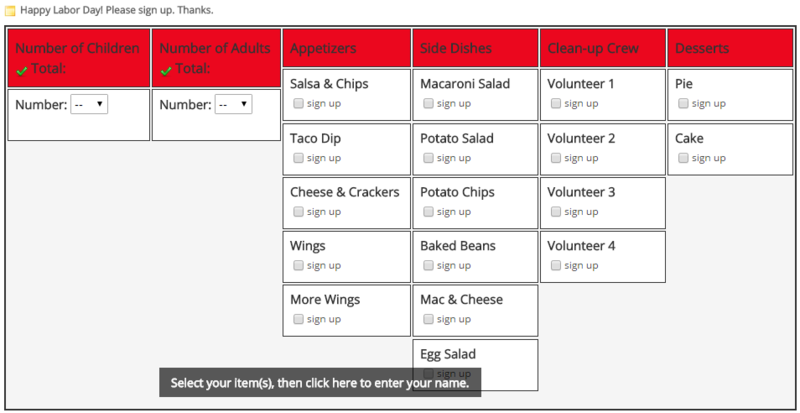 Specify an unlimited number of items will be on the sign up sheet – whether it be food donations, time slots, volunteer shifts, or anything else you think of. TimeToSignUp is flexible to adapt to your needs. 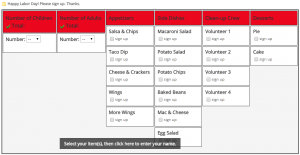 TimeToSignUp is the perfect solution for sports teams, churches, civic groups, schools, PTOs, scout troops and any other organization needing to arrange volunteer shifts, concession stands, pot-luck dinners, car pools, holiday adopt-a-family, food donations, picnics, class parties, team snacks, and many, many more. TimeToSignUp never sells or gives away personal information. While some sites profit by displaying annoying advertisements or selling your personal data, TimeToSignUp is supported by those customers who pay for optional, upgraded subscriptions. Your personal information is safe with us.